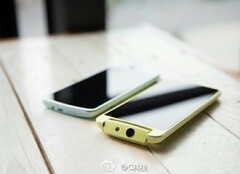 The 5-inch handset will arrive at the end of the month sporting a rotating camera and a frame made of gold. Oppo announced the 5.9-inch N1 flagship with rotating camera back in September 2013 and released it one month later. Now it looks like the N1 mini is very close to its release and will feature a frame of gold next to a rotating camera similar to the one packed by the Oppo N1. According to the latest rumors, the Oppo N1 mini will have a 5-inch display with only 1,280X720 pixels but it it not known yet if other compromises will be made or this handset will have the same major specs as the full-size N1 (Qualcomm Snapdragon 600 processor, 2 GB of RAM, 16 or 32 GB of internal storage). The images that have just appeared on Weibo show a rich selection of colors for the upcoming smartphone which includes blue, yellow and pink, as well as white with golden accents. The Oppo N1 mini could be formally unveiled tomorrow but there is no official statement about it yet. It also remains to be seen if the handset will feature the dual booting capability offered by Oppo N1 or not.